I’m guess most serious examinations of Oliver Stone’s filmography will start somewhere around Midnight Express and move forward from there, with 1981’s The Hand earning perhaps a cursory glance before one takes stock of the politically-charged oeuvre that has largely defined his career. At first glance, it’s tempting to write off directorial debut Seizure as an extreme outlier, perhaps even going so far as to consider it early-career grunt work for a filmmaker trying to break into the business, even if it’s at the helm of a dusty little Can-Am production. Such dismissiveness is quite unwarranted, not so much because Seizure is a hidden masterpiece or the Rosetta Stone that unlocks its director’s career, but because it is a prelude for Stone’s preoccupation with transgressiveness. Both this film and The Hand find him gravitating towards stories about tortured artists whose work take on lives of their own and blur the lines between fiction and reality, something Stone has been rather obsessed with, particularly in terms of reconciling history and celluloid. For Stone, film is a medium through which one can reconstruct reality, so it’s no wonder these early films would reflect art’s capacity to transgress in such a manner. In Seizure, Stone observes an ill-fated weekend for frustrated horror novelist Edmund Blackstone (Jonathan Frid). Having been tortured by nightmares involving a bizarre trio of home invaders, he invites a group of friends over for a retreat. With both his wife and son also in tow, it’s an idyllic gathering shadowed only by some soap-operatic domestic turmoil involving some of the visitors. Even the reports of a local asylum escape rests comfortably in the background, at least until three psychopaths crash the party and subject Blackstone and company to a series of demented (and deadly) games. Arriving alongside the likes of Last House on the Left and The Texas Chain Saw Massacre, Seizure is another exercise in 70s savagery, though Stone’s take is more ethereal and drowsy. If this decade was often marked by the intrusions of waking nightmares, then this is a sleepier tale that suppresses its horrors back to the unconscious. Unfolding with its own form of nightmare logic, Seizure feels as though it’s been cast in a thick haze, leaving viewers with the impression of drowning in illogical rhythms and surreal imagery. Standing in stark contrast the sweltering fever dreams of its strictly American counterparts, Stone’s film is more of a cold sweat in the vein of many Eurohorror productions, particularly the films of Rollin and Bava. Naturally, the resulting atmosphere is engulfed in absolute weirdness, with three maniacs serving as irrepressible loci points for the film’s madness. An incongruent bunch boasting a dwarf (Hervé Villechaize! ), a hulking executioner (Henry Judd Baker), and the self-proclaimed “Queen of Evil” (Martine Beswick), the trio arrives as enigmas and leave just the same way: “Don’t ask who we are or who we came from,” the sinister Queen intones, for they are “without beginning or end.” One of Blackstone’s guests attempts to make heads or tails out of their presence by alluding to their correspondence to ancient mythological figures, but it has all the effectiveness of sorting out the illogical nature of dreams. Perhaps they are simply demons of the mind, agents of an id gone wild: where many films of this era were about projecting such horrors outwards, this one represses them and burrows into a damaged psyche. Many of the horrors perpetrated here are physical in nature, yet that’s hardly a chief concern. The Queen and her cohorts aim represent a primal, chaotic evil that somehow transcends death itself: their ultimate goal is to spread corruption, with their immediate sights honing in on Blackstone’s young son. Both Beswick and Villechaize relish their devious turns, which is a boon since the film is quite talkative for long stretches; you sense that Stone (who co-wrote the film’s screenplay) is plumbing for profundity when his inexplicable images are more than substantial. His hesitance in allowing the film to simply exist as a thinly-veiled document of Manson-inspired hysteria bogs the proceedings down. Once the film’s direction becomes obvious, it becomes even more inert, though that's arguably a case of form following function: so much of Seizure feels like being stuck in a bad dream that you can’t shake. Stone’s rapid-fire editing and time looping especially mimic a dreamlike state and give the film a jagged edge, as there’s a roughness to Seizure that allows it to share the grungy, grimy sensibilities of its contemporaries. Its targeting of both bourgeoisie predators (Joseph Sirola plays a real scumbag) and blameless prey (the Blackstone son isn’t the only one caught in the crosshairs—so too is the family dog and a teenage girl) feels anarchic as well: there is real evil in the world of Seizure, and it knows no bounds. Beswick’s Queen is essentially an eloquent precursor to The Shape. Despite his place as ostensible protagonist, Frid’s Blackstone operates somewhere on the fringes for much of the film. He’s an interesting avatar for this specific brand of 70s nightmare: not only is he a thwarted artist, but he’s also an ineffectual, milquetoast husband struggling to keep his family safe from inexplicable forces. A few years removed from Dark Shadows, Frid is well-matched for the role since acting haunted and forlorn must have been second nature for him by this point. 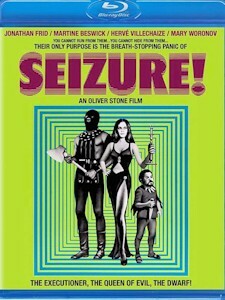 It’s interesting that Seizure is both his story and decidedly not his story all at once: he has no real measure of control, as evidenced by the title: appropriately enough, this is a film that aims to shake both its characters and its audience to their respective cores, which is exactly what Oliver Stone has thrived on doing for four decades now. With its director having reportedly disowned it during that time, it’s no surprise that Seizure has languished in obscurity. It’s only just now made its way to disc courtesy of Scorpion Releasing, whose Blu-ray release features a transfer struck from original vault elements. Parts of the print are a bit coarse, but it’s an altogether fine presentation. A trailer joins a pair of interviews with stars Mary Woronov and Richard Cox, both of whom provide some anecdotes about both this film and others from their respective careers. In the context of Stone’s career, Seizure stands as a strange, almost otherworldly dispatch from an artist struggling to articulate the various demons he’d been struggling with at the time (most of them hailing from Vietnam, surely); I don’t know that he did so successfully, but, then again, I’m not quite sure he ever expected to.